General Characteristics: Short, moderately spreading, very stocky, maturing within 6 to 9 months, producing from 5 to 10 oha; readily identified by the cup-shaped, definitely crinkled blades and light self-green petioles. Petiole: 35 to 50 cm. long, broad at base, thick and rigid, light green with white for 3 to 5 cm. above base. Leaf blade: 35 to 40 cm. long, 25 to 35 cm. wide, 25 to 30 cm. from tip to base of sinus, horizontal, very crinkled and conspicuously cupped, medium green; piko and veins light green; lobes obtuse, distinctly overlapping, with deep, narrow sinus. Corm: Flesh white with indistinct, yellowish fibers; skin cream-colored. Inflorescence: Peduncle light green; spathe usually loosely enclosing spadix to base of plant, light green on lower tubular portion, the upper portion 20 to 25 cm. long, light yellow, usually open and ordinarily rolled only at the tip; spadix usually 17 to 20 cm. long, a spongy naked base with the ovulate portion extending along about 8 to 9 cm. and ovaries sparsely arranged on the lower part, the sterile appendage about 1 cm. long. Origin, and derivation of name: Native variety; it derives its name from the fact that its leaves are shaped like a cup (apu) and hold water (wai) in the form of dew and rain. 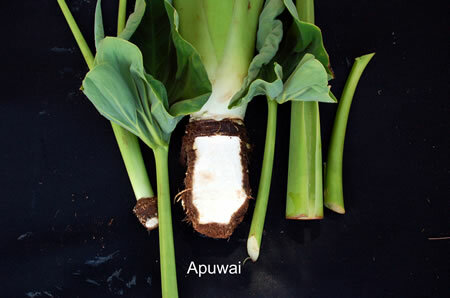 Distribution: Essentially a wetland taro although it is found in a few scattered localities in Kona under upland culture. Formerly it was widely planted, especially in Kohala, Hawaii. It is now sometimes found growing wild in wet places near the woods. Use: This variety is now grown mainly for its leaves which are highly prized for luau. The corm makes good poi of very light color, soft in consistency, and easy to pound and prepare, and also serves as a good table taro.